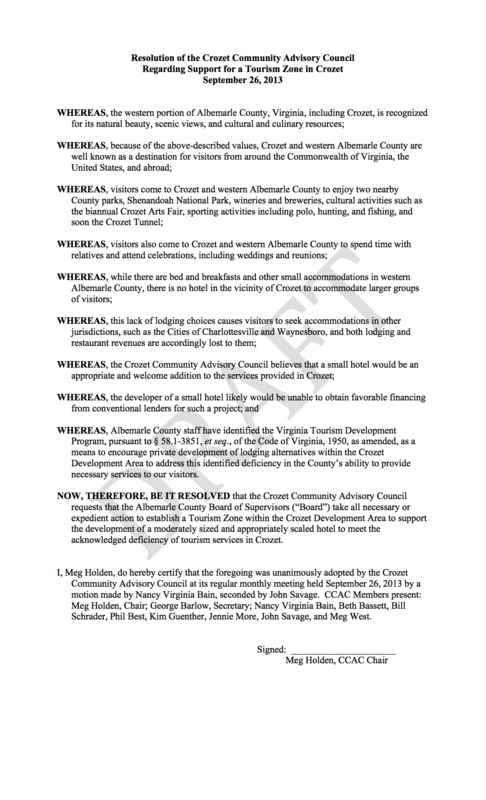 The CCAC discussed and made a resolution at last Thursday's meeting in support of the creation of a tourism zone. You can see their draft resolution below. Career Firefighters Serving as Volunteers Within the Same Jurisdiction. This is a big issue for the Crozet Volunteer Fire Department. Several adjacent counties allow paid firefighters to serve as volunteers at a fire station different from the one where they work. Several Crozet volunteer fireman got full-time jobs at the new Ivy fire station and have been told they can no longer volunteer. I know our wonderful CVFD would appreciate your support in getting the county to change their policy and allow paid firefighters to be volunteers. I urge you to take 30 minutes – review this information and let your supervisors know your thoughts. These are issues that will have a day-to-day life here.